Thousands of blogs are launched every single month, yet only a few ever last more than a few weeks. Part of the reason the failure rate is so high in blogging is that people don’t give much forethought to what people want to read. As a result, nobody visits, the blogger gets frustrated, and things fizzle out. Most bloggers quit within the first three months – at least that’s what social media and digital marketing expert Derek Halpern has discovered in his experience. Some people don’t even make it to the 90-day mark. While there are obviously many different causes, Halpern believes that most failed bloggers can tie their shortcomings to a lack of results. They spend weeks doing lots of little things that don’t really matter – like perfecting their social media profiles or designing a snazzy “About Me” section – and don’t pay attention to the things that add value. If you’re preparing to launch a blog this year, you need to avoid making the mistakes that thousands of other bloggers are making right this very minute. Instead of focusing on superfluous details that don’t really matter, you need to zero in on the things that do. Specifically, you should think a lot about the type of blog you’re launching. Certain blogs perform better than others over the long haul. In order to drive results, stay motivated, and stick with your blog for more than just three or four months, you have to give your readers what they want. Launching another generic blog where you ramble on about all the boring things that happen in your life on a daily basis isn’t going to be interesting to anyone other than your best friend and your mom. But not only do you need to choose a good topic and niche, you also need to develop the right style of blog. There are dozens of unique types of blogs and the strategy you choose will largely determine your potential. It’s important to remember that styles change, new platforms arise, and the methods by which digital content is disseminated and consumed change on a regular basis. Having said that, the following types of blogs are powerfully effective in 2017. Let’s start with niche review blogs. These are blogs that focus on a certain industry or market and review products and services within this well-defined niche. The reason these blogs work so well is that they focus on a very targeted audience. While the overall size of the audience may be smaller than that of a general blog, the level of engagement is much higher. Readers come to these blogs looking for something very specific and will spend a long time on the site consuming content. SurveysSay is one example of a niche review site. They frequently publish posts about different online review sites and provide an honest, third party analysis so that readers can make better judgments on which sites are worth their time. It’s a strong website that really makes the most out of its status as a niche review blog. The beauty of blogging is that it’s raw and real. Contrary to the biased, sensational marketing that most customers are exposed to on a regular basis, blogs tend to be very direct and transparent. As a result, “rogue opinion” blogs are really popular. These are blogs that take a bold stance on divisive issues and stick to their guns. Most people really love or hate these blogs – but both categories of readers allow them to thrive. Danger & Play is an example of a rogue opinion blog. It features alt-right political viewpoints that are considered by many to be extreme. As a result, people flock to the blog. Many hate it, others love it, but it’s highly successful, nonetheless. The third type of blog that currently works well is the “crash-test dummy” blog. This is a blog where the author takes on a new challenge and basically writes about his experience – the ups, downs, and highlights. Readers love these sorts of blogs because they provide a firsthand look at what it’s like to go through an experience from start to finish. This blog from designer Liz Marie is a classic example. The blog walks readers through Liz’s process of fixing up and decorating an 1800s farmhouse. The fourth and final blog type to be discussed in this article is the classic hobby blog. As the name suggests, a hobby blog is a blog that focuses on a specific area of interest – such as farming, woodworking, crocheting, reading, playing guitar, etc. These blogs are great because they are highly sustainable and always have a captive audience. Fresh Eggs Daily is one example of a successful hobby blog that does all of the little things right. It’s authored by a fifth generation gardener and touches on all of the different topics that other gardening enthusiasts are interested in. Launching a blog takes time, energy, and effort. In fact, it takes a lot of all three. The last thing you want is to spend weeks developing a blog, only to realize that nobody wants to read the content you’re publishing. In order to avoid wasting your time, make sure you’re choosing the right type of blog. 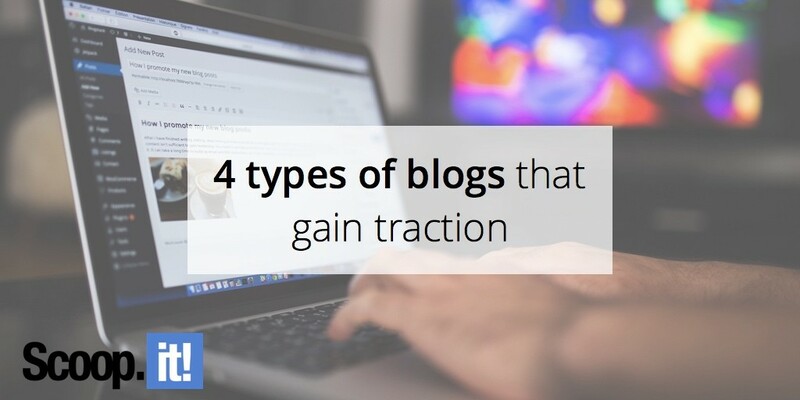 By no means does this article provide a comprehensive list of the different blog types that are successful, but it does give you a little glimpse into a few different ones that tend to produce positive results. Do your research, stop focusing on the little things that don’t matter, and put your best foot forward. Who knows? Maybe you can beat the odds and develop a successful blog that lasts longer than three months.